jump-off, and the 41 year old German-based rider snatched victory when second-last to go against the clock riding Lady Georgina Forbes' Castle Forbes Myrtille Paulois. "It was a very special win, and I feel quite emotional" Kuerten said afterwards. "We really wanted to win, we were unbelievably motivated and we had to go very fast to beat Gregory Wathalet. Winning this and the Queen's Cup on Tuesday has made it a fairytale week!" she added. Belgium's Wathalet took runner-up spot with Sea Coast Cortes C while his fellow-countrymen Jos Lansink (Casper Van Spieveld) and Niels Bruynseels (NASA) filled third and fourth places respectively as the home riders put on a great show in front of their own crowd in the packed Nekkerhal Arena. 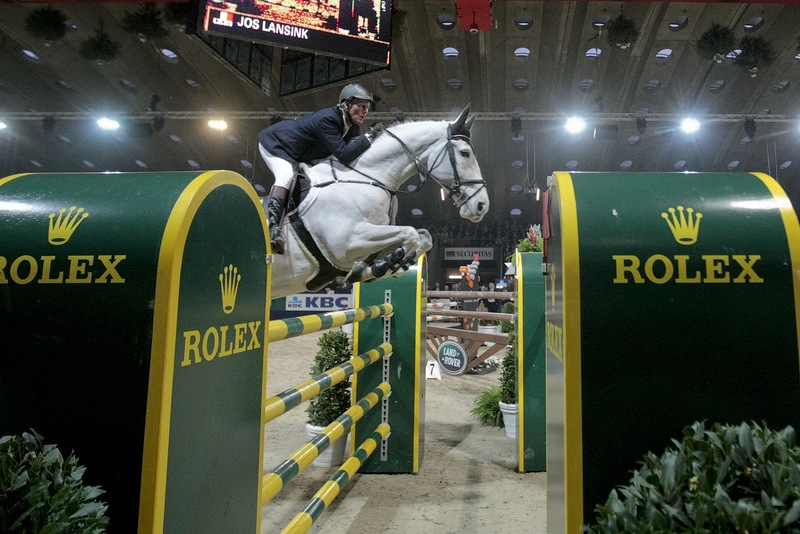 Kuerten described the track set by course designer Lucien Somers as "big, wide and technically difficult" and it certainly tested the skills of the competitors from 17 different nations who lined out at this popular annual fixture at the Nekkerhal Arena. The triple combination - oxer, vertical, oxer - proved particularly influential. "The distances in the triple were difficult and when the horses arrived at the double (the penultimate obstacle on the 13-fence track) they tended to remember that and sometimes jumped it awkwardly too" the winning rider pointed out. 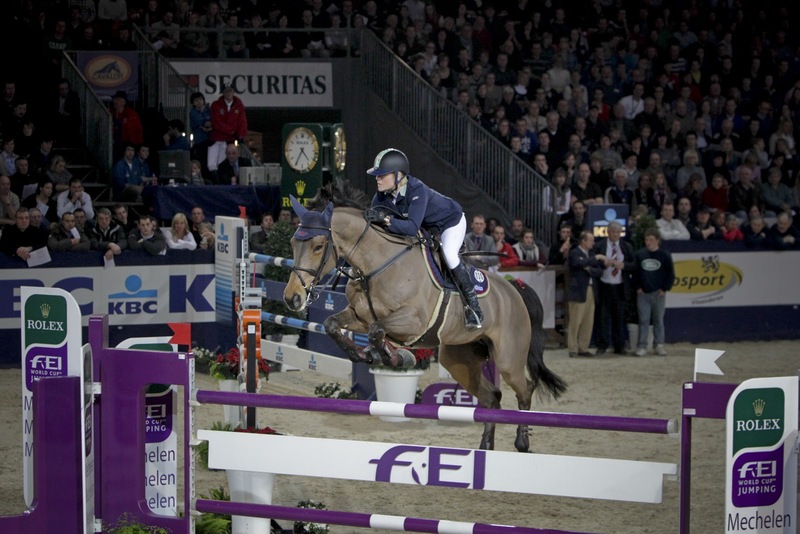 Finland's Nina Fagerstrom decided to call it a day after a hair-raising ride through the triple with Talent while Great Britain's Ellen Whitaker also retired after double-faulting with Equimax Ocolado. Two competitors - Simon Delestre from France riding Couletto and Germany's Daniel Deusser with AD Untouchable - suffered the intense frustration of completing a clear jumping round only to collect a single time penalty, but they had the compensation of claiming fifth and sixth places respectively while a total of 14 riders left a single fence on the floor in the first round and the fastest of these was Dutchman Albert Zoer who slotted into seventh spot with Sam. Gregory Wathalet, who celebrated his 34th birthday on Christmas Eve, was pathfinder against the clock with Sea Coast Cortes C - one of two 8 year old horses to make it through to the timed round. And the Belgian rider who recently returned to compete under his native flag after transferring is allegiance to the Ukraine for the last few years, set the pace with a great clear in 40.44 seconds. Fellow-countryman Niels Bruynseels followed with the handsome mare NASA who carries all the hallmarks of her famous sire Cumano who carried Jos Lansink to individual glory at the 2006 World Championship. 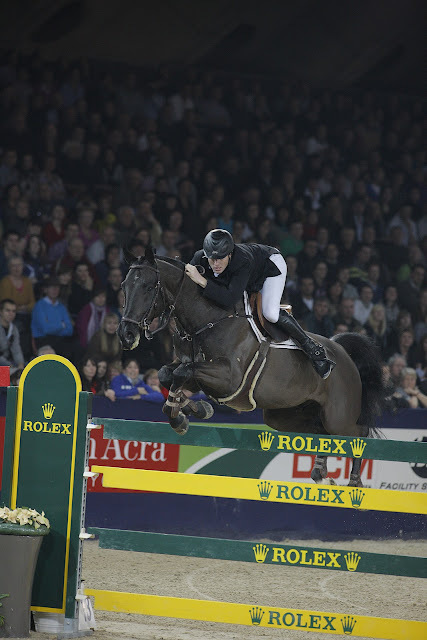 But Bruynseels realised he was behind on time as he turned to the last, and when he pushed the nine year old grey towards the final planks she hit that for four faults in 41.28. Kuerten's round was crisp, clean and filled with determination however, and Castle Forbes Myrtille Paulois rose to the occasion as never before. 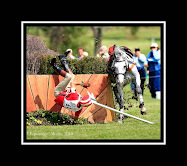 "She's really in top form right now" the 41 year old rider said afterwards. "She was second in the Grand Prix at La Coruna last week and this was only her second World Cup competition - she was really fast today" Kuerten pointed out. Riding with pin-point accuracy all the way, the Irish rider was clearly up on time coming to the last which she cleared to re-set the target at 39.94 seconds. But Kuerten knew the game wasn't over yet because Lansink was yet to go. And the 2006 World Champion produced a thrilling ride from the 8 year old Casper Van Spieveld which he has only had in his yard for the last two weeks. The big grey by Mr Blue defied his massive frame to shave more than a half-second off Kuerten's target, but once again the final planks would claim another Belgian victim so Lansink had to settle for third place while the Irish rider scooped the €13,000 winner's purse, a brand new Landrover vehicle and the coveted Rolex watch that goes to the winner of each round of the Rolex FEI World Cup™ Jumping series. Having rocketed up from 43rd to 11th place on the leaderboard after today's success, Kuerten now has the final in Leipzig, Germany firmly in her sights. "I really want to get there and my plan is to compete in Basel and Amsterdam, then I have a wild-card for Zurich and the Irish spot for Bordeaux and Vigo" she explained. But most of all today she was just really happy with the result produced by Myrtille who, like all the rest of the Irishwoman's string, has long competed in the shadow of her great ride Castle Forbes Libertina. "Libby" as she is better known lined out in the minor classes at Mechelen this week and is expected back in top-flight action very soon after a long injury break, but in her absence Castle Forbes Myrtille Paulois got her chance to shine - "I'm really proud of her" Kuerten said. "It's the perfect end to the year and I'm hoping that 2011 continues in the same vein!" she added. 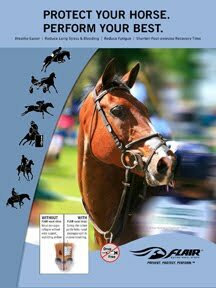 For further information on the Belgian fixture at Mechelen go to website www.jumping-mechelen.com or contact Press Officer Edith de Reys at Email edith.dereys@skynet.be or Tel +32 475 659 281. The next leg takes place in Zurich, Switzerland 28-30 January 2011. For all information on the Swiss fixture check out website www.mercedes-csi.ch or contact Press Officer Roman Gasser at Email rgasser@viva.ch or Tel + 41 79 635 5005. Result: 1, Castle Forbes Myrtille Paulois (Jessica Kuerten) IRL 0/0 39.94; 2, Sea Coast Cortes C (Gregory Wathalet) BEL 0/0 40.44; 3, Casper Van Spieveld (Jos Lansink) BEL 0/4 39.62; 4, NASA (Niels Bruynseels) BEL 0/4 41.26; 5, Couletto (Simon Delestre) FRA 1/72.58; 6, AD Untouchable (Daniel Deusser) GER 1/72.96; 7, Sam (Albert Zoer) NED 4/65.61; 8, Kraque Boom (Kevin Staut) FRA 4/65.98; 9, Nuage Blue (Pilar Cordon) ESP 4/66.10; 10, Calado (Jorg Naeve) GER 4/66.51. A total of 17 nations were represented in today's competition - Ireland, Australia, Austria, Germany, Belgium, Finland, Switzerland, Spain, Denmark, Sweden, Norway, Colombia, The Netherlands, France, Italy, Great Britain and New Zealand. There were five 8 year old horses in the competition including Sea Coast Cortes C which finished in runner-up spot for Gregory Wathalet and third-placed Casper Van Spieveld ridden by fellow-Belgian Jos Lansink. Jos Lansink - "I only have my horse for the last two weeks - we competed in just one competition before this at a CSI 2-Star in Holland last week". Gregory Wathelet - "If I had been third to go against the clock I might have taken more of a risk but I also maybe would have had more faults - I'm happy with the way it worked out for me today!" Jessica Kuerten - "I decided going into the ring against the clock that it was a case of 'all or nothing' !"